Do you want versatile and durable flooring solutions? Our experienced professionals are here to help you find the flooring of your dreams. With endless choices in flooring options, we work with you to determine your stylistic and functional preferences so we can narrow down the selection to the options that best serve your needs. Our luxury vinyl tile and luxury vinyl plank flooring are available in various colors and styles; both are durable enough to stand up to many years of wear and tear. This means you get to maintain the beauty and strength of your new floors for years to come. We strive to give you not only the products and services you need to improve your home, but also the convenient flooring experience you deserve. That’s why we offer three ways to shop. You can come into the store to browse through our inventory in person. 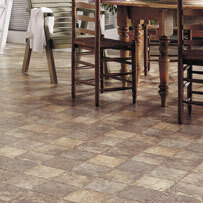 This way you can see and feel what a resilient flooring option vinyl tile can be. Alternatively, you can look at and order from our online selection. Lastly, you can give us a call and we’ll bring you the luxury vinyl floor tile of your choice. No matter how you like to shop, we have you covered. Whatever way you choose to shop, you can always benefit from the professionalism and expertise of our staff. Our flooring specialists help you choose which options are best suited for your particular needs. Once you have selected a few samples, our designers can help you imagine exactly what your new space will look like with the different samples you like, which allows you to see for yourself what the one best option is. The last part of the process is help from our luxury vinyl tile installation team. These professionals work efficiently to ensure maximum beauty and durability with minimum wait time. Count on our professionals for the latest in durable vinyl floors. Our manufacturers have found many ways to improve vinyl so this flooring is better than ever. New, innovative technology strengthens the material so it stands up to heavy traffic and resists scratches. But we don’t substitute strength for beauty. Our embossing technology allows for a variety of patterns and styles, from luxury vinyl plank flooring that mimics hardwood to earth-colored vinyl square tiles that look like natural stone. No matter what type of flooring you desire, you can look to vinyl as a cost-effective, quality alternative. An added benefit to the way vinyl tile is manufactured is that it is virtually waterproof. This means it stands up well in spaces like laundry rooms, bathrooms, basements, and kitchens—rooms where other flooring options may not be as durable. The inherent water resistance of our luxury vinyl floor tile also makes cleaning a breeze. Spills from drinks, food, and other sources settle on the surface of the floor, unable to penetrate into the material. This reduces the risk of stains, meaning your floors will look newer for longer. Turn to our designers and flooring specialists to help you find the perfect style for your home. Interior decorating goes through different trends, but high quality never goes out of style. One of the most popular trends we have seen lately is the luxury vinyl plank flooring. Because of the manufacturing process, this type of vinyl comes in planks that look just like real hardwood, including the grains, knots, and texture of wooden floors. Customers also love our tile that mimics natural stone and ceramic. We help our customers see the virtually limitless possibilities they have with our vinyl selection. One big draw to vinyl besides its versatility and affordability is its sheer comfort. Many of our luxury vinyl tile options come with fiberglass backing, making them more cushiony than the average flooring material. This is especially important in rooms where you stand a lot, such as the kitchen or the laundry room. With more padding, your feet will certainly thank you. Count on our experts to stay with you throughout the entire flooring process. At our flooring company, we work as a team. That means all the goals and expectations you express to our flooring specialists and designers when choosing your luxury vinyl floor tile get passed on to our installation professionals. Your flooring goals become our flooring goals and we keep your needs at the forefront of our work during each task. Once you have chosen the vinyl flooring you absolutely love, you can expect our installers to be as your home as soon as possible. We know preparation and proper installation are the keys to long-lasting flooring, which is why we take our time to complete each task correctly. We never cut corners and always strive to give you the high-quality flooring solutions you deserve. Take advantage of our services to ensure complete satisfaction with your new floors. We strive to provide each one of our customers with the best luxury vinyl tile available, not only in selection, but in overall value. We want you to be 100% satisfied with your new floors and with the entire selection and installation experiences. We back our work up with a complete satisfaction guarantee so you know you are getting the best value available, and that your new floors will last for years to come. With limitless options in color, style, and design, our professionals help you choose the stylish, resilient flooring options that best suit your needs. Talk to our experienced professionals to start the process. Whether in-store, online, or at your home, our professionals help you find the flooring that enhances the aesthetics, function, and value of your home. Contact us to find out more about our luxury vinyl tile options. We proudly serve the flooring needs of Akron, Cuyahoga Falls, Stow, Hudson, and Fairlawn, Ohio, as well as the nearby areas.